Nowadays, Hasbro gets a lot of reference material for product development well in advance to the premiere of a movie like Star Wars: The Force Awakens, be it a cool new vehicle or a visually striking character like, say, the fearsome Constable Zuvio. 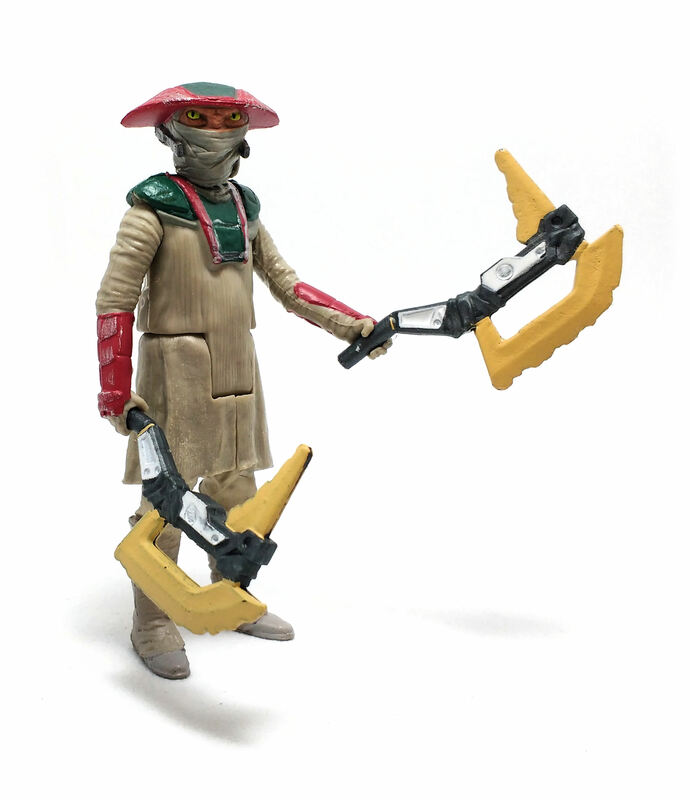 Zuvio is a kyuzo alien, the same species as bounty hunter Embo, from the Clone Wars. As is often the case, the real life version of these aliens does not match the animated concept too closely, but the overall traits are easy enough to recognize. 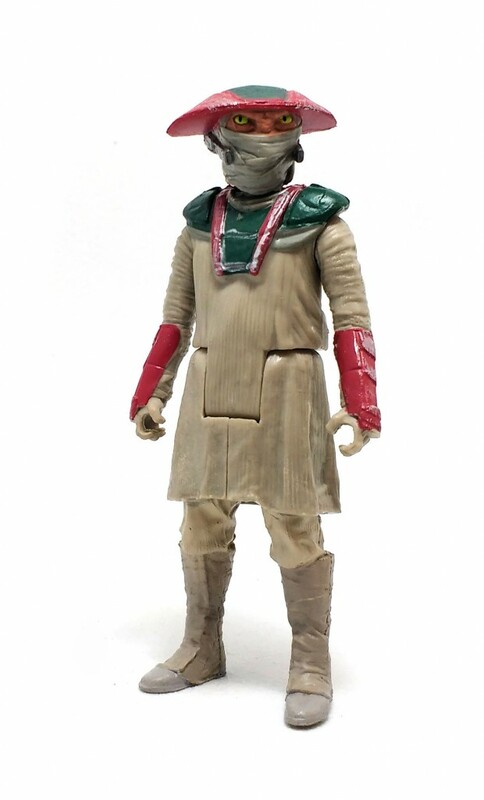 The sculpture work on this 3.75-inch Constable Zuvio is very good, full of nice little details like the texture on the exposed skin and the wrinkles on his clothes. 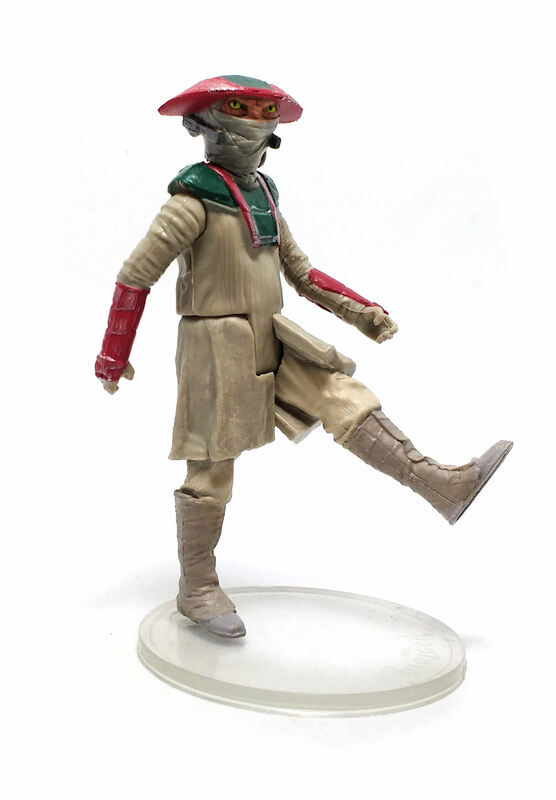 Zuvio is sculpted in a fairly neutral stance, but somehow it manages not to look static, as if a sudden gust of wind could make his loose garments flap all over him. 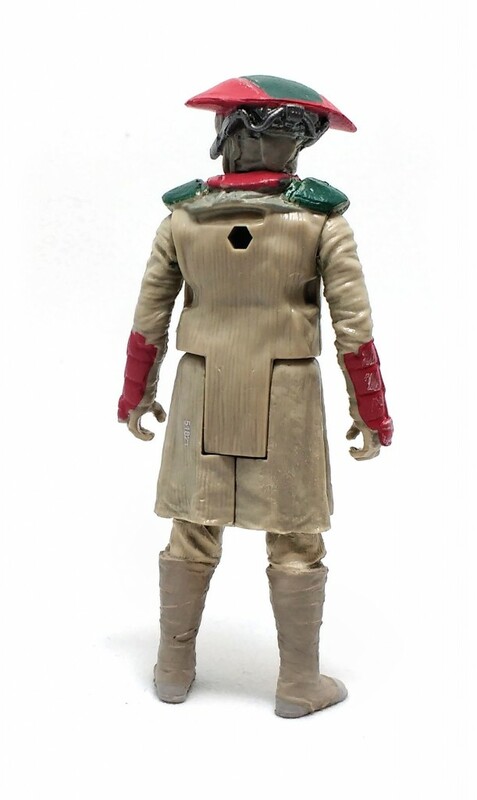 There is very little to see in terms of a portrait, as Zuvio goes with the lower part of his face covered in rags, but you can tell Zuvio is not a joyful person, a fact confirmed by the little text blurb on the package. 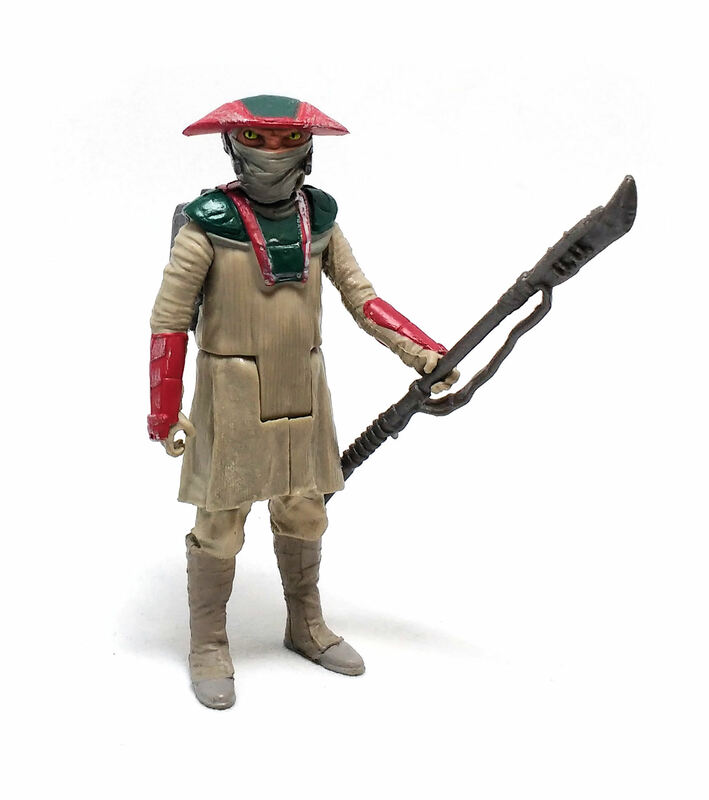 Constable Zuvio was designed with five points of articulation: swivels at hips and shoulders and a ball-jointed neck. This reminds me a lot of the older vintage figures, although there is one little thing I particularly like on these newer figures. Remember how Hasbro sculpted the robes and skirt pieces on the vintage figures? They were fundamentally big solid chunks of plastic split in the middle to articulate the legs. On the recent years, you can see a fully sculpted leg inside the robe or skirt piece, which not only saves on plastic but also looks a lot better, in my humble opinion. 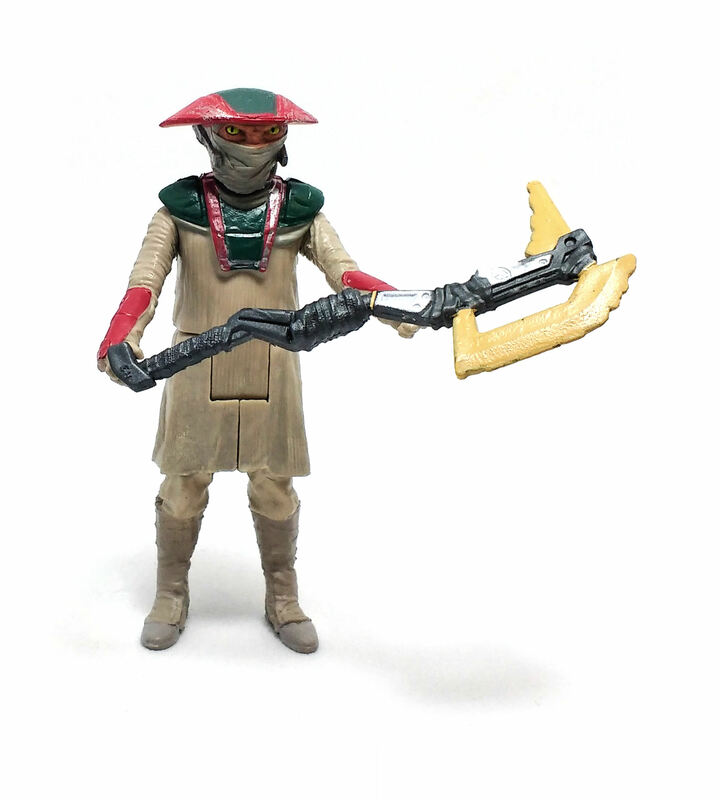 Speaking of looks, the paint applications on Zuvio are pretty decent, although there is just not a lot of variety on the color palette. The figure is molded from tan/sandy plastic and only his armored bits and face feature some color. The armor is decorated in scarlet and green, with a few highlights in silver to simulate scratches. The skin tone is very similar to the scarlet on the armor and seems to have a paint wash to enhance the texture, but the most striking feature has to be the cat-like green eyes. Now, on most of the figures I saw at the store, the eyes were painted looking straight ahead, but the one I ended up buying has the pupils shifted slightly to the right, giving him a more interesting look. 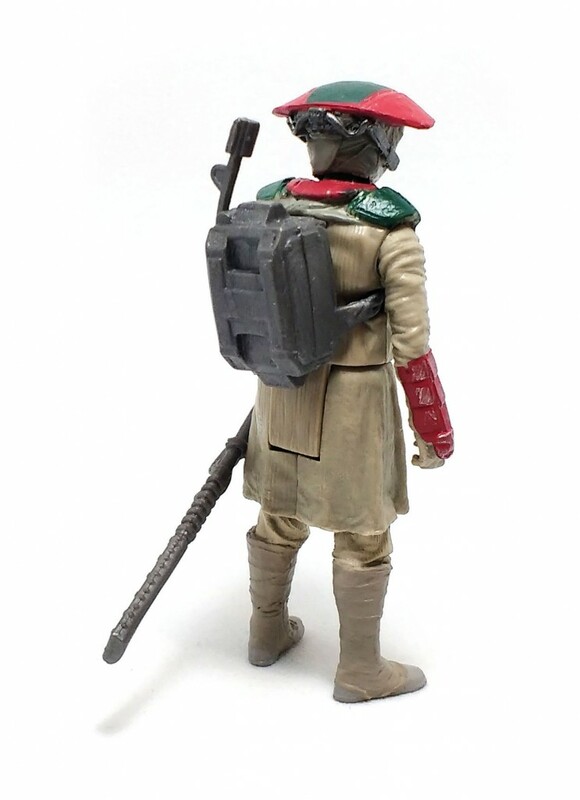 Zuvio comes equipped with a silvery gray backpack that plugs to a hole in his back and a pike molded in the same color with a studded stock and an irregular shaped blade at the tip. 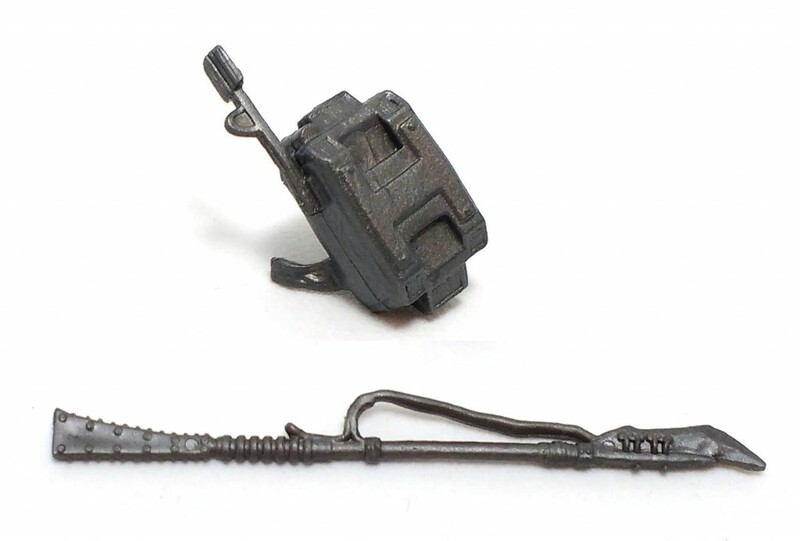 In addition to these accessories, Zuvio also comes with the corresponding pieces to complete the Desert Build-A-Weapon. 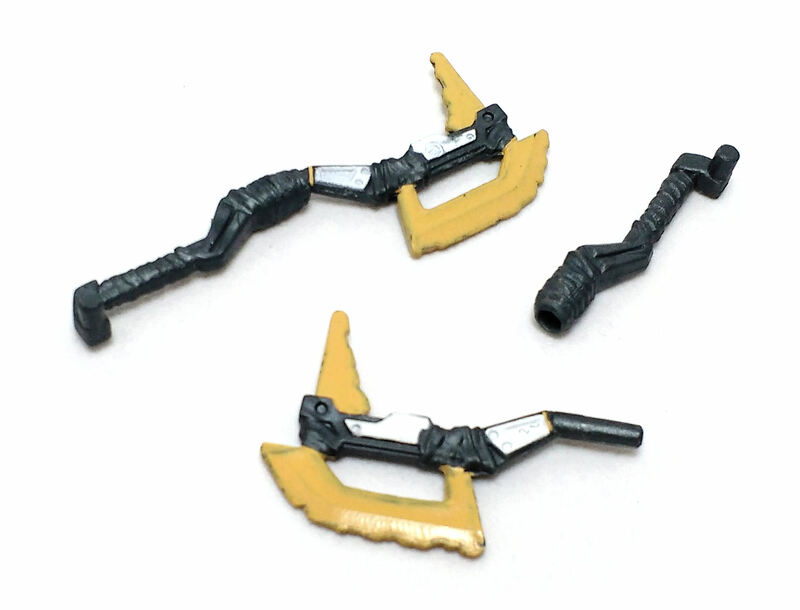 These BAW pieces are a couple of large polearms, which can have their shafts shortened to be used as axes. Constable Zuvio can actually used both weapons without looking too ridiculous, which is a definite plus although not necessarily an endorsement for the whole Build-A-Weapon concept. In truth, there is really not a lot to criticize with this figure. I like how it looks and I like how it’s built, although truth be told, deco could have been kicked up a notch. As a matter of fact, leaving the whole articulation talk aside, about the only thing that can be said against it doesn’t even have to do with the toy itself, but with the way movies are made these days.